April showers bring out the foul-weather nature lovers! 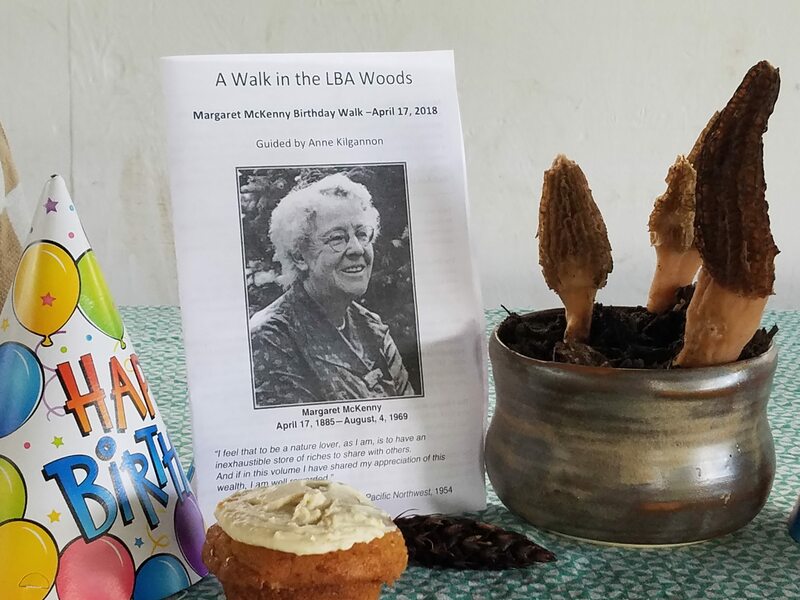 Thanks for everyone for celebrating the 133rd birthday of Margaret McKenny today on our our second guided walk in the LBA Woods. Our stalwart group braved construction traffic, rain showers, and muddy trails to enjoy a morning graced with the sights and sounds of spring: the Pileated Woodpecker, Pacific Wren, and Red-shafted Flicker (among others) were busy in the snags and understory of the forest. Beneath the evergreen canopy of towering Douglas-fir, and Western Hemlock, Western Red Cedar, the tender green leaves of the Red Huckleberry, Ocean Spray, Osoberry, Elderberry, and Salmonberry gave the forest a delicate, filigreed look that is all but lost by early summer. Today, that store of riches, protected in the LBA Woods, included stories of the lesser-known lifeforms such as “Witches’ Butter” jelly fungus, the resident Mountain Beavers (truly), and a few perfect trillium blossoms–a native plant Margaret worked hard to protect. Margaret’s spirit was with us on the walk and afterward as we shared hot tea, cupcakes, and camaraderie following this very vernal, very special stroll.